This Strawberry Cream Cheese Pie Recipe delivers some serious strawberry happiness! Craving a delicious strawberry dessert? Or is it your turn to bring a Pie to the party?? 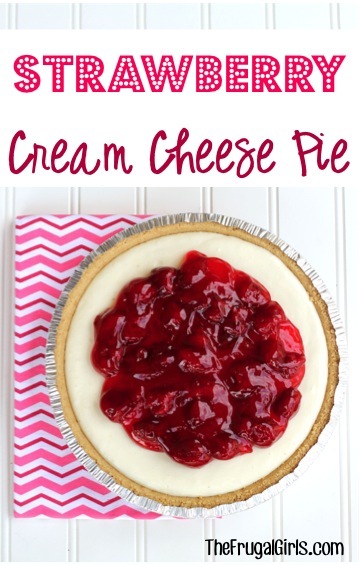 You’ll love this Easy No Bake Strawberry Cream Cheese Pie Recipe! It’s so simple and super strawberry deliciousness!! You’ll get all the benefits of a delicious cheesecake style dessert without ever turning the oven on or heating up the kitchen! Related: How to Get Free Grocery Gift Cards! 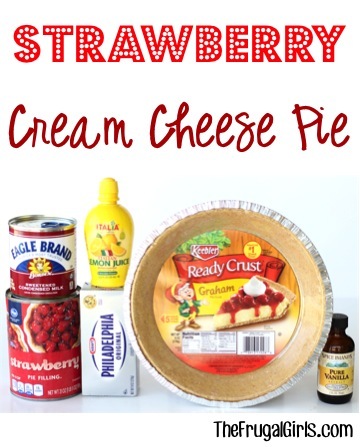 Strawberry Cream Cheese Pie Recipe! 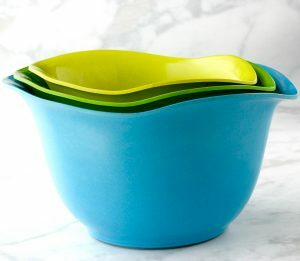 Beat Cream Cheese in medium mixing bowl until fluffy. Add Sweetened Condensed Milk, Lemon Juice, Sugar and Vanilla Extract, and beat until well combined and creamy. Pour into Graham Cracker Pie Crust, and cover. Also place Strawberry Pie Filling can in refrigerator to chill overnight. 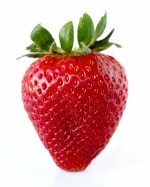 When ready to serve, remove from refrigerator and carefully pour contents of chilled Strawberry Pie Filling can onto the top of the pie. 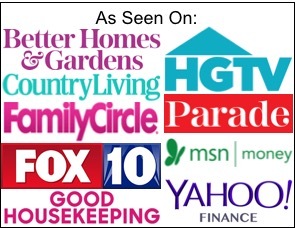 Craving more delicious Easy Fruit Pie Recipes, and Strawberry ideas? 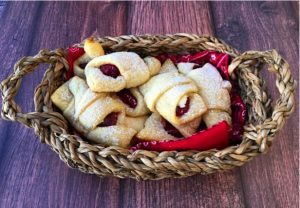 Craving a seriously delicious Cherry Pie? 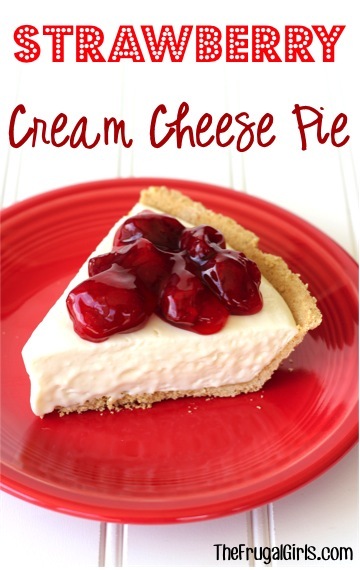 This Cherry Cream Cheese Pie serves up some seriously rich decadence with a cherry on top! 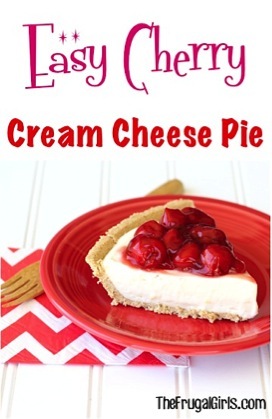 You’re gonna love this crave-worthy Easy Cherry Cream Cheese Pie Recipe! 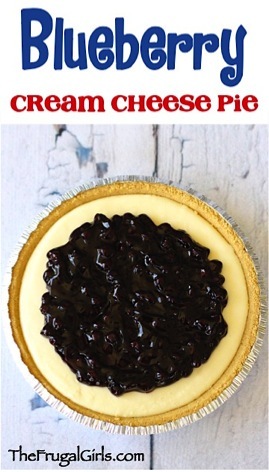 This Easy No-Bake Blueberry Cream Cheese Pie Recipe will satisfy your dessert cravings and is the perfect addition to your Dinner, Party, 4th of July Meal, or Holiday Meal! It’s blueberry cream cheese decadence to the max! So simple and SO delicious! Ready for the recipe? Satisfy your cravings for delicious blackberries! 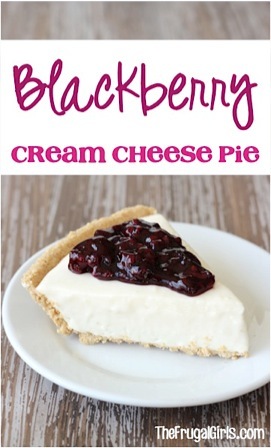 Jazz up your plain cheesecake with this Easy No-Bake Blackberry Cream Cheese Pie Recipe! It’s cream cheese heaven topped with a delicious Blackberry topping! Ready for the recipe?? Some things are simply too good to be kept a secret. 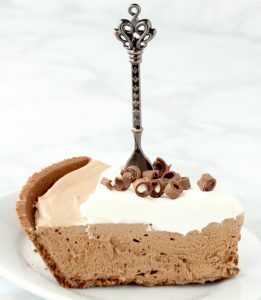 This Hershey Chocolate Pie recipe needs to be shared! Here’s another fun way to satisfy your strawberry cheesecake cravings! 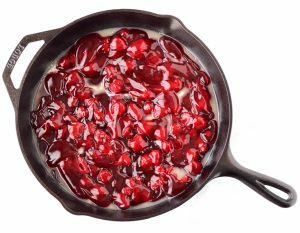 Strawberry cravings meet their match with this easy Skillet Strawberry Cobbler with cream cheese! Strawberries are my absolute favorite food group! 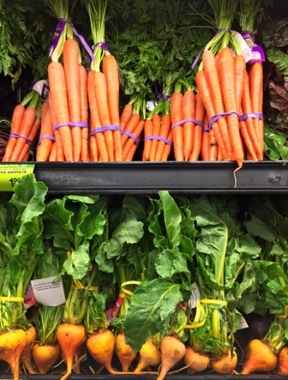 Seriously, I can’t even imagine a world without strawberries. 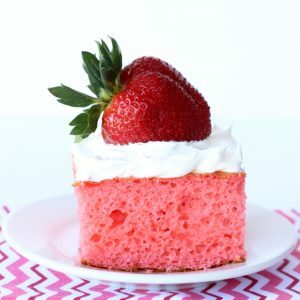 Get ready to load up on even more strawberry deliciousness with these delicious ideas! 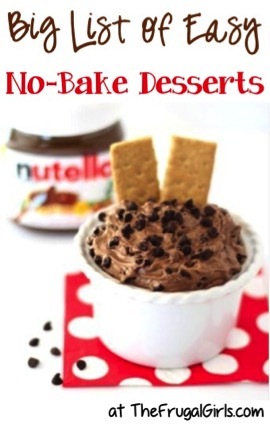 Take the heat right out of the kitchen with these delicious No Bake Dessert Recipes! Have you ever made Strawberry Cream Cheese Pie before?